From one of the most popular series on public television, these stunning productions provide a view of Europe’s most beautiful sites in stunning, high-definition clarity. Take an emotional visit to your family’s homeland, revisit favorite sites, or take the trip of a lifetime without leaving home—whatever your inspiration, you’ll never have a better view. Europe is a beautiful continent filled with majestic mountains, breathtaking architecture, and various famous landscapes and landmarks. While I've actually never been, after watching 'Visions of Europe' I certainly feel like I have. Well, sort of. Actually, I don't feel like I've been there at all. I just feel like I took a really long helicopter ride over the entire continent while various facts were whispered into my ears by a disembodied but extremely educated voice. I saw a lot, I heard a lot, but I don't think I really learned or gained anything worthwhile or meaningful from the experience. But please don't tell the disembodied, all-knowing voice that. She scares me. A collection of twelve, one hour scenic programs, 'Visions of Europe' is a sometimes dreamy, sometimes monotonous journey through many of the continent's most beautiful and awe-inspiring sights, both natural and man-made. With over fifteen hours of material here, big fans of Europe and travel shows should be more than pleased. Much, much more than pleased. Perhaps too pleased, even. In fact, is it possible to be so pleased, that you end up not pleased at all? I mean fifteen hours of sweeping helicopter footage is a bit much, isn't it? The various programs included in the set take us through numerous locations in Italy, France, Greece, Austria, Germany, and several other exciting European countries. A helicopter mounted camera becomes our vantage point throughout the proceedings and voice over narration provides facts on the countries, cities, and cultures that are depicted. Classical, traditional, and even a few popular music tracks play over the serene settings. The actual content of the footage itself can be breathtaking. The soaring camera picks up some wonderful angles and gives an all encompassing view of the areas featured. From Provence to The Riviera, Bavaria to Sicily, the sights are all astounding giving us a look at the famous towns, resorts, landmarks, roads, mountains, seas, islands, castles, and cathedrals that make up Europe. Bolstering the visuals are narrations from a variety of participants that feed the viewer various factoids, bits of trivia, and even occasional poetic musings on culture and philosophy. The actual content ranges from interesting to unnecessary (do we really need to know where the Pope vacations in the summer?) and the voices themselves vary from soothing to downright annoying (one male narrator is particularly irritating). Music plays on in the background throughout, and some of the choices are simply wonderful (including one of my favorite pieces, Smetana's "The Moldau"). The music usually fits well with the images, but there are some choices that seem to clash with the visuals, and not all the song selections are as worthy as others. While there certainly is a lot to admire about these programs, unfortunately, the reality is that there just isn’t a lot of substance here. The facts can be insightful, but more often than not the narrator is just an annoyance and no matter how amazing the sights are, after a while, constant helicopter shots of various countries can't help but lose their luster. At their best, there really is an almost mesmerizing quality to the marriage of landscapes and music, but at their worst, these seem more like something you'd see playing in an infinite loop on the welcome channel of a hotel television set. The visuals are nice, but there is little variance in the shooting style and it all just starts to blur together and becomes extremely redundant and downright boring. With no in depth examination of the cultures, people, and history of the places we see (outside of brief facts and stories read off a script) these programs have very little long lasting appeal. They might have worked better if they were shorter, but at almost an hour each, they are simply too long to remain interesting with such a lack of substantial content. 'Visions of Europe' certainly succeeds in giving viewers some interesting shots of the gorgeous continent, but that's basically all it does. The narration and facts can be worthwhile but more often than not add little to the proceedings, and can't ever hide that fact that there just isn't much here. Without any kind of noteworthy substance to latch onto, these are merely helicopter tours of Europe, which is all good and well but doesn't exactly make for a very compelling or varied watch, especially when there is over fifteen hours of the same kind of material. There is a certain tranquil quality to the programs but I can't really imagine why anyone would need to own all of these. While I don't mean to put down the impressive technical accomplishments of the cinematographers, there is little actual artistic merit here. This might be stimulating material for some (and indeed it seems these programs are actually pretty highly regarded), but for me, these are just kind of boring, and there are many better travel programs available that actually have something interesting to say outside of sweeping visuals. 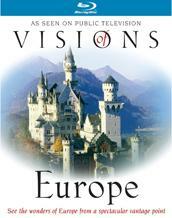 Acorn Media presents 'Visions of Europe' in a six disc boxset that includes 'Visions of Italy,' 'Visions of France,' 'Visions of Greece,' 'Visions of Austria & Europe,' and 'Visions of Germany.' Each of the separate programs is housed in a standard case that contains one BD-25 disc, with the exception of 'Visions of Italy' which contains two BD-50 discs. Each disc then contains two separate one hour programs. All of the individual plastic cases are packaged in a cardboard box. After some logos and warnings the discs transition to a standard menu. The programs are all presented in a series of 1080i/AVC MPEG-4 transfers in the 1.78:1 aspect ratio. For the most part (I'll elaborate below), all of the films feature the same strengths and weaknesses. For a series of programs that are all about the beauty and grandeur of the locations they present, you’d think that the video transfers would be the main highlight here. You'd think, but you'd be wrong. Cutting to the chase, at times these look more like lackluster broadcast feeds than high quality Blu-ray video. The main issues with all of the transfers are some intermittent artifacts and a sometimes heavily compressed appearance. Everything from banding, noise, aliasing, shimmering, flickering, stuttering, blocking, and various other strange motion anomalies pop up throughout. For whatever reason, 'Visions of Italy' fares the worst when it comes to jaggies and features the most egregious and distracting aliasing and shimmering of the set. Though these artifacts are also visible on all the other discs, the aliasing is much less of a hindrance on the remaining programs. With that said, all of the episodes suffer from a fairly compressed quality and while subtle at times, the blocking present can be problematic. Most visible in water and in skies, the image occasionally breaks up and pixelates. Even ignoring the various artifacts and sometimes very odd anomalies, clarity is still a bit disappointing. Sharpness can be good, but there is a lack of distinction between fine details and a mostly low grade appearance to the visuals. The actual content of the footage is at times breathtaking, and there are indeed instances of depth, but the pervading, poor technical quality of the images puts a damper on the whole thing. Colors can look nicely saturated in some shots and a little washed out in others, and contrast too can appear natural or blown out, all depending on the locations and the time of day. The strength of the material being shot does shine through, and there are stretches where the video looks pretty decent and artifact free ('Visions of Greece,' in particular, is the most consistent). Unfortunately though, the overall video presentation suffers from a noticeably compressed look that features periodic artifacts and motion anomalies. While not horrible, for a series that is essentially all about its visuals, this is downright unacceptable. The video basically resembles mediocre HD broadcast material, and while that's fine for cable or satellite, it's not for Blu-ray. This is a subpar presentation that disappointingly does little justice to the gorgeous locations it depicts. Each episode is presented with an English DTS-HD Master Audio 5.1 track, a Dolby Digital 2.0 track, and a "music only" Dolby Digital 2.0 track, with the exception of 'Visions of Italy' which has a Dolby Digital 5.1 track, a PCM 2.0 track, and a PCM 2.0 "music only" track. English subtitles are available on all the discs. Featuring some great classical music choices and sometimes pleasing separation and fidelity, these are pretty decent tracks. The narration is clean and easy to understand. Separation and surround use varies from musical track to track. Some pieces are fairly front heavy and lack range, while others feature a more expansive soundscape and full gamut. Bass is mostly subdued, but a few musical pieces do bring out some decent low end. There are some occasional pops and crackles here and there but nothing too major. Balance between the narration and music is fine, but there are some volume fluctuations between different musical pieces. The actual musical tracks are all pretty good but the quality of their presentation differs somewhat on case by case basis. Still, the majority of the mixes provided do a nice enough job of bolstering the visuals. Acorn has included bonus footage for almost all of the programs featured in the set. The footage essentially offers more of the same, with additional shots of various locations set to music, though all of the bonus material is without narration. The special features are presented in 1080i with Dolby Digital 2.0 sound, with the exception of the additional footage for 'Greece,' which is provided in upscaled 1080i. Northern Style Bonus Footage (HD, 20 min) - More footage from the various northern locations of Italy are included in 1080i set to music presented in Dolby Digital 2.0. Southern Style Bonus Footage (HD, 26 min) - More footage from the various southern locations of Italy are included in 1080i set to music presented in Dolby Digital 2.0. Sicily Bonus Footage (HD, 23 min) - More footage from various locations in Sicily are featured in 1080i set to music presented in Dolby Digital 2.0. Provence Bonus Footage (HD, 23 min) - More footage from various locations in Provence are included in 1080i set to music presented in Dolby Digital 2.0. The Riviera Bonus Footage (HD, 24 min) - More footage from various locations in The Riviera are included in 1080i set to music presented in Dolby Digital 2.0. Greece Bonus Footage (HD, 31 min) - More footage from the various locations in Greece are included in upconverted 1080i set to music presented in Dolby Digital 2.0. Off the Beaten Path Bonus Footage (HD, 19 min) - More footage from various locations featured in 'Off the Beaten Path' are included in 1080i set to music presented in Dolby Digital 2.0. Austria Bonus Footage (HD, 19 min) - More footage from various locations in Austria are included in 1080i set to music presented in Dolby Digital 2.0. Bavaria Bonus Footage (HD, 22 min) - More footage from various locations in Bavaria are included in 1080i set to music presented in Dolby Digital 2.0. Along the Rhine Bonus Footage (HD, 21 min) - More footage from various locations featured in 'Along the Rhine' are included in 1080i set to music presented in Dolby Digital 2.0. 'Visions of Europe' provides a visually encompassing but unfortunately empty and redundant tour of the continent. The helicopter angles are nice but lack variety, and though some of the narration is insightful, there is only so much interest one can gain from voice over facts. The video quality here is disappointingly subpar and suffers from a compressed appearance. Audio is decent but still not very noteworthy. Supplements are plentiful but just offer more of the same. Unfortunately, since the main draw here is visually related and the video is lackluster, even fans of these types of programs will probably want to skip this set.